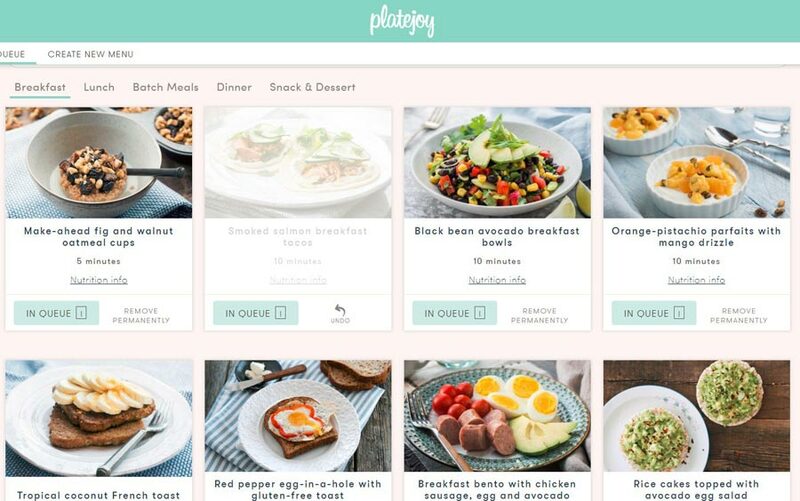 PlateJoy Review: Healthy Family Meal Plans Done For You! I’m a busy mom, just like you! 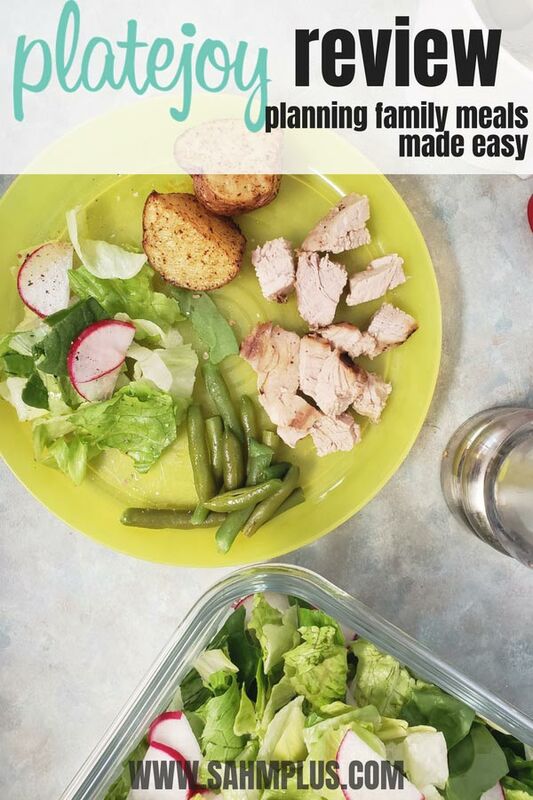 That’s why I wanted a meal planning service to plan food for me every week. This is our 1st week PlateJoy review. As I prepare for back to school season, I realize this means my busy season is about to start back. Shortly after school begins, after school activities, meetings, meet the teacher nights, and homework are about to take over. We took the summer off from sports and didn’t put either of the kids in camp, so we’re out of routine. Though I felt as if we needed a break from all the structure, being out of routine helped me get into this rut. I often throw a few of our family dinner favorites in my weekly meal plans just because I know I won’t get complaints from the family. Then, I’ll throw in a whole chicken when I need to make my homemade chicken broth. But, I’m bored of dinners and tired of scouring Pinterest for new recipes in hopes they’ll be winners. 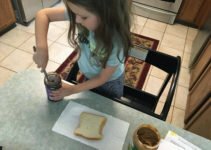 Being out of routine means we’re going to be struggling when my daughter starts back to school. And I’m really tired of garlic shrimp and breakfast nights on seemingly constant rotation just because I don’t want to spend the time searching out new recipes. One thing will remain constant. Taco Tuesdays are a family favorite. And, everyone got made when I switched beef out for chicken, so every week is beef tacos. Actual tacos or taco salads is just a decision one makes on Tuesdays. I didn’t really want to learn how to meal plan. 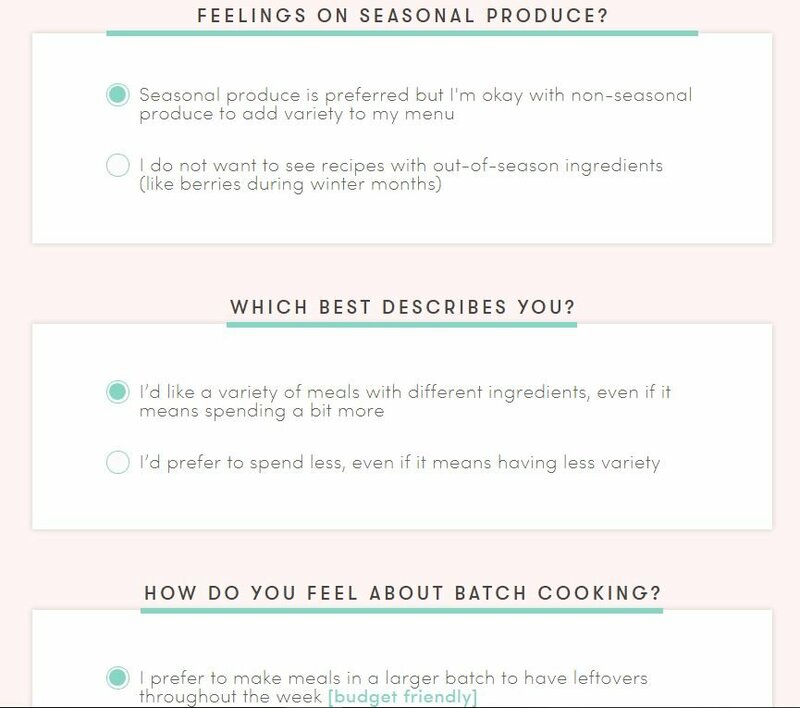 I needed a meal planning website that would provide meal plans for busy moms! I’d gotten lazy and I needed inspiration. I reached out to PlateJoy who gave me a few months of their service to try out, which is why I’m sharing a PlateJoy review. All opinions expressed here are my own and I wouldn’t recommend a product or service I don’t actually like. Affiliate links are included in this post. First things first, you have to actually get started with PlateJoy. 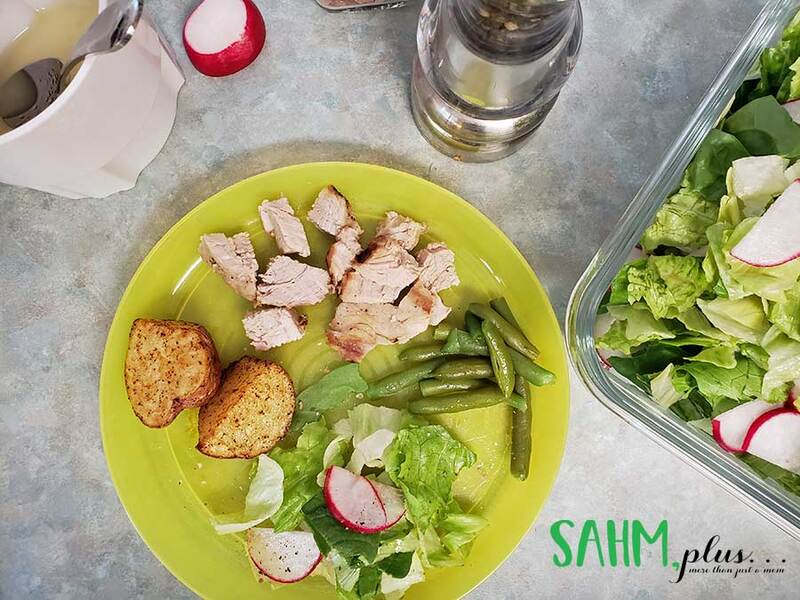 You can sign up for a 14 day-free trial and get $10 off the subscription of your choice with PlateJoy with code SAHMPLUS10. 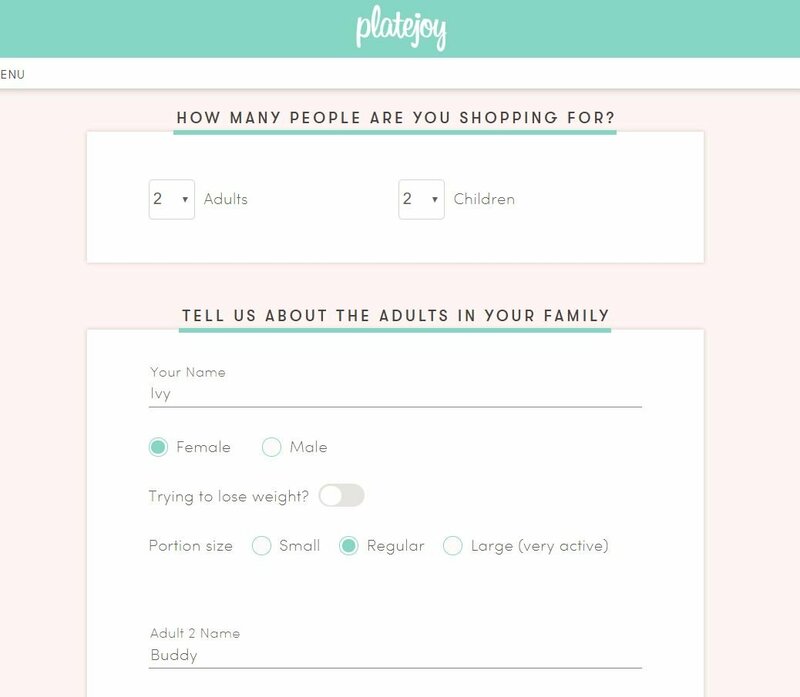 Once you’re ready to start with meal planning with PlateJoy, you’ll enter a few details about your family and meal preferences. You’ll start with entering how many adults and children, name each member of the family, and tell the system how to calculate portion sizes for each. There’s even a setting for each if one person wants to lose weight. 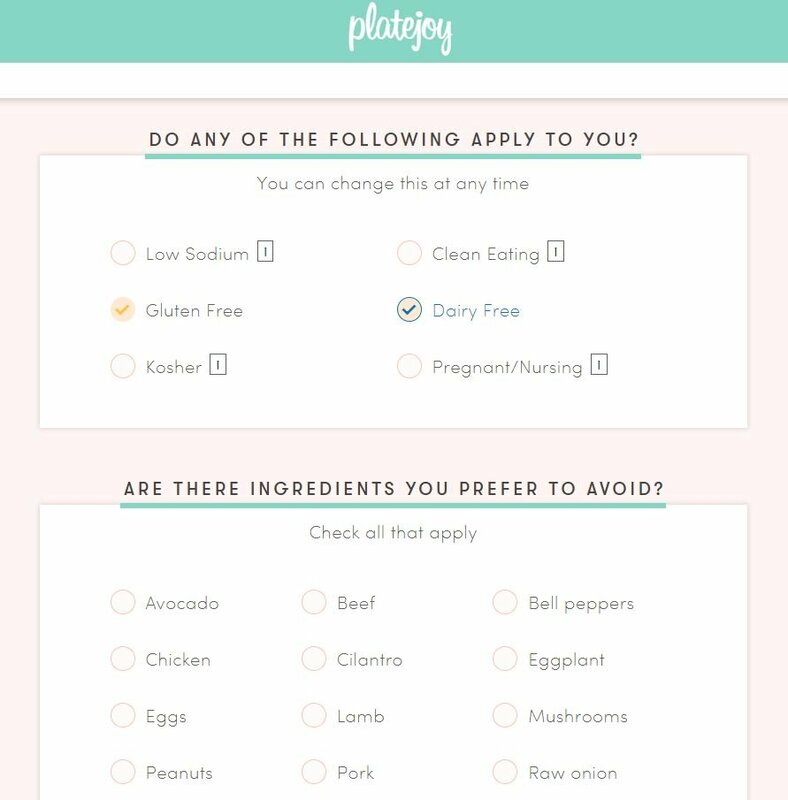 Next, you’ll indicate dietary restrictions and foods you’d like to avoid. Now, when you do this, it affects the meals for the entire family, so everyone will be eating the same thing. In my case, this is great because I don’t believe in making separate meals. However, I know this can be a problem for others who don’t believe the rest of the family should “suffer”. I have to avoid gluten and dairy, and listed that I need to stay away from almond, and preferred to avoid soy. Essentially, my meal plans are going to be border-line Paleo (except we eat potatoes, rice and a few other non-Paleo foods). After entering your dietary preferences, you’ll tell PlateJoy a little about your budget preferences. This is also going to define the variety of options you’ll receive from them. In my case, I somewhat value variety over budget, although I did select that I would like larger meals for leftovers, which was a more budget-friendly option. 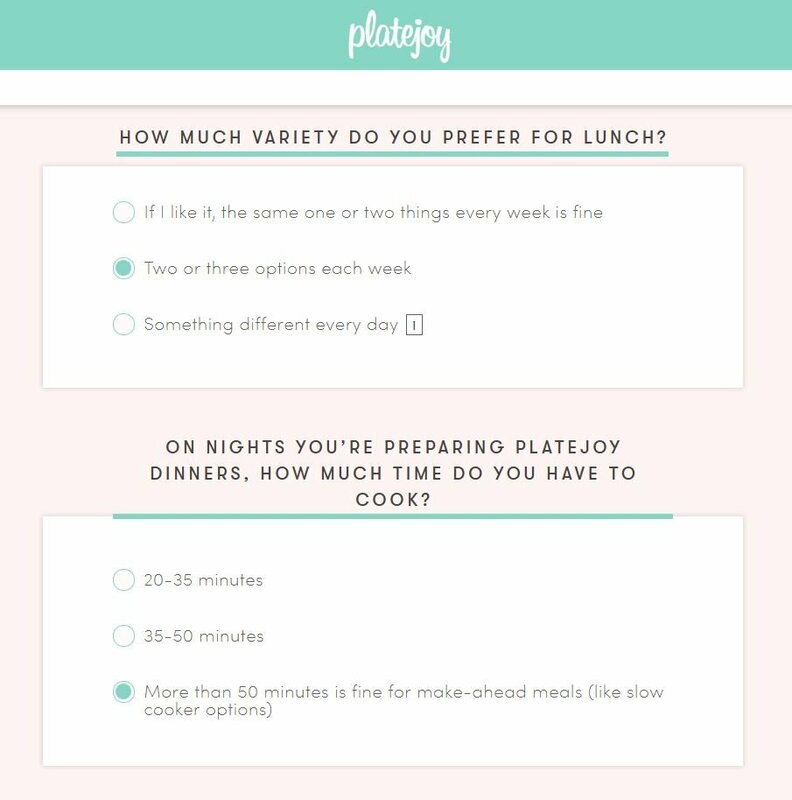 Aside from options about variety, you’ll also get the chance to tell PlateJoy how long you have to prepare meals. For dinner, because I’m a stay at home mom, some days I have more time than others. So, I selected the option to allow this to vary. I chose “more than 50 minutes” to allow for slow cooker meals, but they have other options including 20 – 35 minutes, or 35 – 50 minutes. So if you’re a 30 minute chef, PlateJoy will have something for you. Afterward, you’ll be looking at some of the initial selections PlateJoy has made for you. This is the perfect opportunity to remove foods you are certain you won’t eat, then search for other foods and have them added to your meal plan. If variety is your thing, make sure to select enough so that you won’t see the same thing in rotation too often. 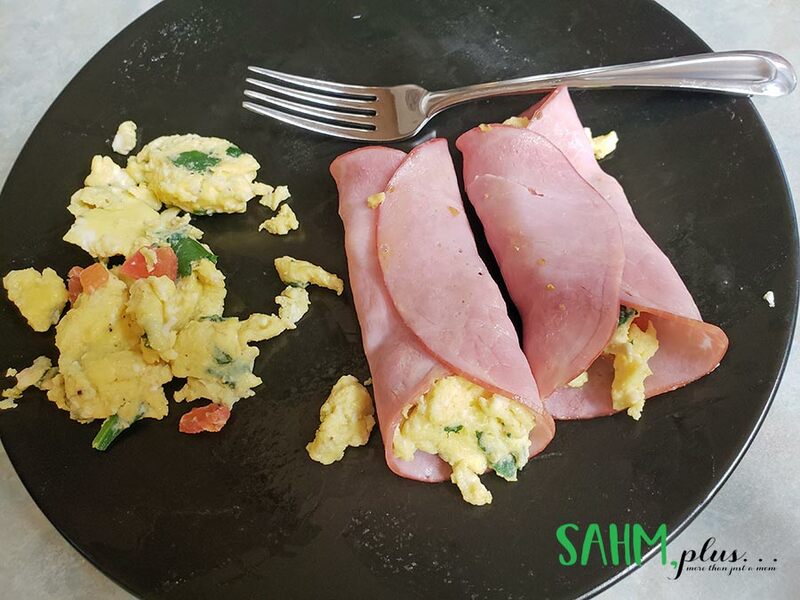 Check out my breakfast choices as I worked on my initial meal plan! Our family’s first week with PlateJoy was interesting. I’d already pre-planned a few meals that week, so I only needed 3 dinners and requested 1 breakfast that I could make for 2 days. I chose not to include lunches because I rely on leftovers to get through the week, myself. For dinner, we ended up with 3 pork recipes and I didn’t want to mess with swapping meals, so I just spaced those out around the meals I already had planned. 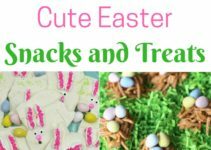 My daughter and I loved these! The toddler enjoyed it, but not nearly as much and I need to cut his up. I ended up having to scale the recipe down a bit, mainly because the 4 eggs it called for could have made about 5 or 6 of the roll-ups. So, I removed one egg from the recipe the second day I made this. The best part about this breakfast was that I could break up the spinach and cut the tomato the night before. This made cooking breakfast a lot quicker in the morning and only took about 5 minutes to prepare. In total, it only took about 10 minutes with cutting vegetables and cooking the eggs. I wasn’t overly fond of my Jerk seasoning, but I don’t blame this on PlateJoy as it was a pre-purchased seasoning mix. However, the meal itself was pretty good. 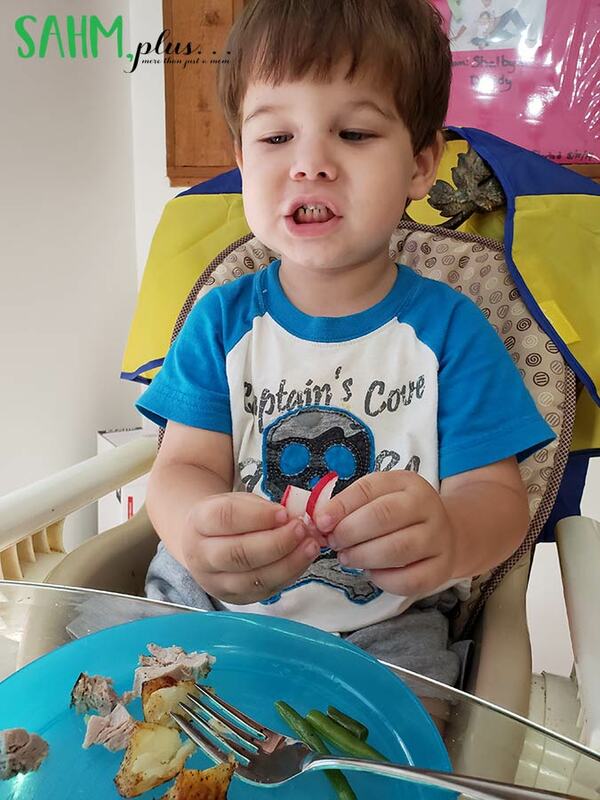 Even the picky toddler chose to eat his salad first, which was quite impressive! I scaled the salad down quite a bit for our family because 12 cups of lettuce for 4 people seemed a bit much. Also, a pork roast and salad isn’t a very filling meal, so I added white rice and black beans to our meal. My husband isn’t very fond of stuffed peppers in the first place because he won’t eat bell peppers. And, I worried no one else would eat the quinoa. So, this meal still required me to create an additional side. Turns out, I didn’t mind the plain quinoa and neither did the 6 year old. Also, this meal ended up making enough that I froze half batch of the peppers for cooking another night. I attribute this to the “leftovers” selection which appears to create leftovers for the entire family. Even still, the half I made had enough leftovers for myself and my daughter for 1 afternoon. This meal was surprisingly good, in my opinion. The glaze was added to the pork tenderloin after you cooked it for a bit. I had worried that adding the glaze later would mean the meat wouldn’t have enough flavor, so I’d seriously been tempted to marinate it. But, I stuck to the recipe and was rather surprised at the results. I think the best part was the glaze wasn’t overpowering in the ginger department, which I thought might have been a turnoff. Instead it offered just enough flavor to know it was there. Again though, I had to add something extra to our meal because we don’t consider a side salad filling enough. I especially struggle to gain and maintain weight, so I need more substance than salads offer. I think my family really enjoyed the new variety PlateJoy meals provided. 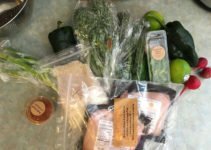 We were introduced to some really healthy foods including fruits and vegetables we don’t normally eat, which was really helpful to getting me to eat more Paleo like I should. Although, because of my food allergies, staying Paleo is impossible because I can’t have some of the things Paleo requires. Because I need to gain weight, I need more food than all of the meals planned for. A meat with a salad just isn’t a meal in my mind and doesn’t fill me up the way I’d like. Still, PlateJoy saves me time by providing my meal options and then I just add things as I see fit. This allows me to save a lot of time skimming through all sorts of recipes and prevents me from sticking to things I know. The kids enjoyed each of the salads and surprisingly even the toddler tried some new foods like radish and mango. 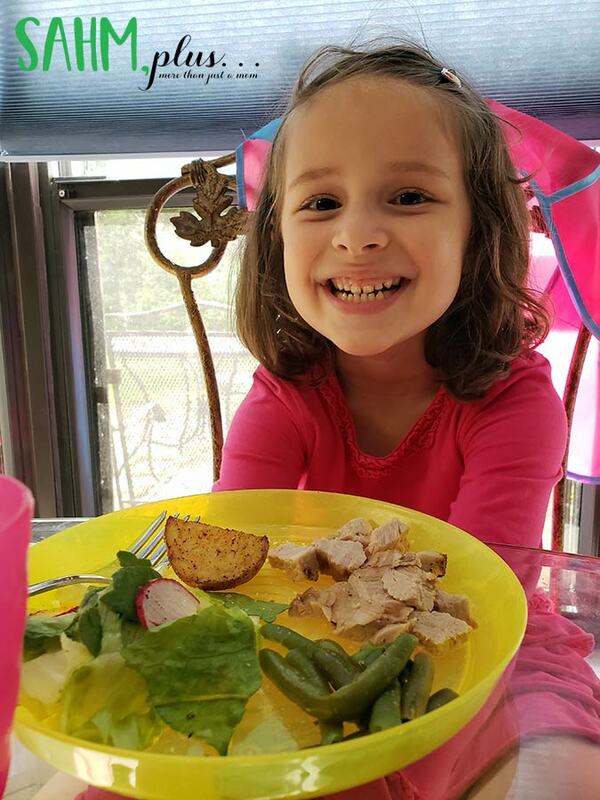 That, alone, makes PlateJoy worth the cost, knowing my kids are eating healthy and trying new foods. Hubby doesn’t care one way or another. He eats for substance so he rarely makes a fuss about what we eat and also doesn’t make a big deal if something is good. He’s my neutral party. Finally, though I found it extra work to add more sides to our meals, I enjoyed PlateJoy. It saved me time and helped me to cook breakfast some mornings. Additionally, I found myself craving healthier snacks between meals. Instead of grabbing a somewhat healthy granola bar, I often chose to eat an apple or banana with the kids. I think I can attribute it to the cleaner eating I was doing with dinner and breakfast, so it was resetting my taste buds for staying healthy, overall. I have a few months more of PlateJoy and I can’t wait to share more of our experiences with you. 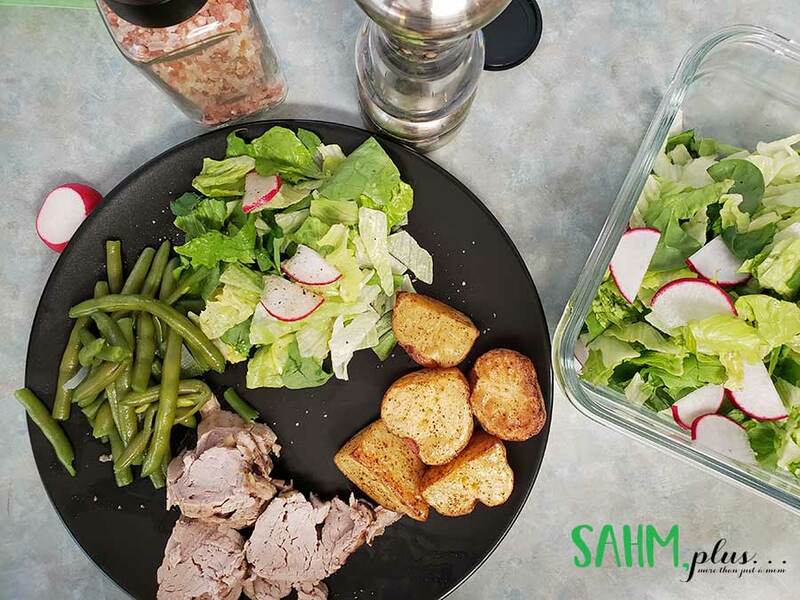 If you enjoyed my PlateJoy review and would like to try it for yourself, you can get $10 off any subscription with code SAHMPLUS10. Enter the code at checkout on PlateJoy. Did our PlateJoy review help you determine if it’s right for you? Tell me in the comments if this helped or if you’d like more information about PlateJoy! Was there something I didn’t cover that you’d like to know? There are so many of these companies out there now. It’s great to get perspective from real users when trying to decide which one to try! I tried to be as informative as possible too! I know I couldn’t find enough information when I was looking either! A frozen pizza and taco night are a given. Everything else is up in the air!